The remains of a priory founded by Robert de Brus in AD1119 for Augustinian canons. 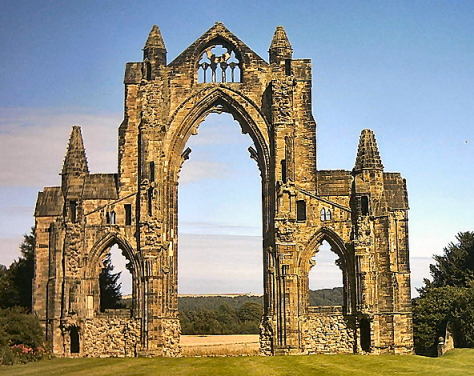 One of the greatest monasteries in the North East, it was the 4th richest house in the county at its suppression in 1540. The Norman gatehouse at the western end of the site is the only surviving element of the original Priory. It has survived because in the sixteenth and seventeenth centuries it was used as an entrance to the Chaloner mansion in Bow Street. It dominated the life and fortune of both the town and the surrounding countryside throughout the middle ages when it was said to have supported 500 households. The priory is now in the care of English Heritage and volunteers from the Gisborough Priory Project have maintained the long flower borders since July 2004. Local legend has it that a ghost, known as the Black-Cowled Monk haunts the site of the priory on the first new moon of each year!